While Toyota, Nissan and Honda dominate, six other companies also pay claims and make accruals for cars, trucks and buses made in Japan, or made elsewhere by a Japanese company. And while none besides Toyota & Honda report all their warranty metrics, most leave enough clues for outside observers to plug the holes with estimates. The great car countries of the world are Germany, Japan, the U.S., and more recently, China. Together, OEMs based in these four countries pay 80% of the world's automotive warranty claims and hold 82% of its automotive warranty reserves. Factory warranties are a big deal for all of them, not only in terms of expenses, but also for advertising, brand image, industry ratings, and customer satisfaction. Increasingly, the automotive manufacturers based in those four countries are either fully compliant with Accounting Standards Codification rules for warranty expense disclosures, or they're close to it. All American-based public companies are required to be compliant. International companies do so to make it easier to do business in the U.S. Given that the worldwide auto industry is also so loquacious about sales figures and unit production volume, we now have a trifecta of data sources to work with: warranty expenses, revenue figures, and unit sales totals. And we propose to start working with the Japanese data, where we find nine manufacturers who together have most of the nation's global market share in cars, trucks and buses. To put together this single-country spotlight, first we gathered sales and warranty expense data for the two largest automakers based in Japan: Toyota Motor Corp. and Honda Motor Company Ltd. For more than a decade, they more or less been have been following FASB Interpretation No. 45, its successor standard ASC Topic 460, and the international equivalent (IAS 37), as have most of the major automotive OEMs in Europe and elsewhere in Asia. Next, we gathered whatever data was available from five more Japanese automakers: Mazda Motor Corp.; Mitsubishi Corp.; Nissan Motor Co. Ltd.; Subaru Corp.; and Suzuki Motor Corp. Some reveal just their warranty reserve balance. Others also reveal the amount they accrue each year. All disclose their annual revenue and unit sales. To make this work -- to fill in all the slices in the pie charts -- we need at least four metrics from each company: the amount of claims paid, the amount of accruals made, the amount of reserves held, and the amount of products sold. In cases where a given manufacturer did not disclose all four metrics, we cobbled together estimates based on industry trends for the one, two, or sometimes three missing metrics. In some instances there were tricks and shortcuts involved. For instance, in several cases the companies revealed the beginning and ending balances in their reserve fund, as well as the amount they accrued each year. So we were basically solving an algebra equation for the missing amount: claims paid. It's not generally accepted accounting principles, but it fills in the blanks. Because many of these manufacturers sell not only passenger cars but also trucks and buses, we also included two additional large vehicle manufacturers based in Japan: Isuzu Motors Ltd. and Hino Motors Ltd. That way, our data set includes most of the automotive OEMs based in Japan and all of the vehicles they produce, be they cars, SUVs, buses, light trucks, or heavy trucks. There's even some motorcycles, boats, and planes in the mix. And there are engines and generators as well. Let's begin with a simple pie chart of the amount of claims these manufacturers paid in the fiscal year that ended on March 31, 2018. Our estimate is that the industry total in fiscal 2018 was 1,100 billion yen, which at prevailing exchange rates is about US$10.5 billion. Of that 1,100 billion yen total, Toyota paid about 53%; Honda paid about 21.6%; Nissan paid about 11%; and Mazda paid about 4.4%. Labels wouldn't fit for the other five in Figure 1, so here they are in text: Mitsubishi (blue) and Subaru (yellow) were at 2.8%; Suzuki (light green) was at 2.7%; Hino (red) came in at 1.3%; and Isuzu (purple) was at 0.4%. These are not vehicle market shares. It's a claims paid pie chart for Japan. 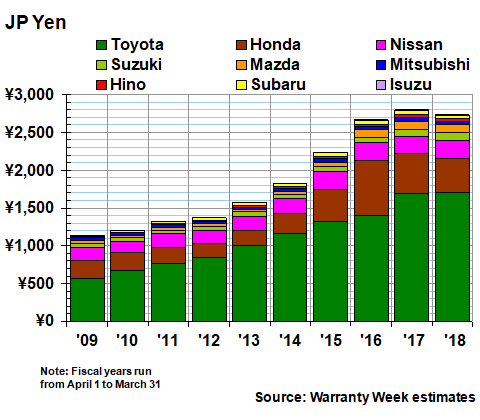 This 1,100 billion yen worldwide total for warranty claims paid by Japanese automakers is expensed against 67,500 billion yen in reported sales, for a 1.65% average claims rate in the 12 months between April 2017 and March 2018. It was a little above average, but that claims rate was down more than a quarter of a percent from the unusually high levels seen in fiscal 2017. We should note that the Toyota figures includes data for Daihatsu Motor Company Ltd. as well as for the Lexus brand. And of course it includes all Toyota vehicles made or sold in the U.S. Honda includes Acura. Nissan includes Datsun and Infiniti. On a worldwide basis, these three conglomerates together paid nearly 86% of the Japanese-based auto industry's total claims in fiscal 2018. Over the past decade, their share of the Japanese total has ranged from 83% (in fiscal 2013 & 2014) to 89% (in fiscal 2017). And the Japanese total has ranged between a fifth and a quarter of the world's total, depending on how you compare calendar and fiscal years, and what currencies you use. In Figure 2 we're providing ten years of claims estimates for these nine Japan-based manufacturers. Notice that the peak annual total came in fiscal 2017 (April 2016 to March 2017), when claims payments surpassed 1,200 billion yen (US$10.9 billion at exchange rates prevailing at the time). It was a record year not only for total claims payments, but also individually for Toyota, Honda, and Nissan. In that bad year, Toyota paid 605 billion yen; Honda paid 341 billion yen; and we estimate Nissan paid 137 billion yen. Rather unexpectedly, the low water mark for claims payments came in fiscal 2013, when we estimate that these manufacturers paid out 580 billion yen (US$6.2 billion). What makes it unexpected was the fact that it was not also the low point for sales. In both yen and dollars, that took place years before, in fiscal 2010. In fact, sales were lower than they were in fiscal 2013 in every year from fiscal 2009 to 2012. So the fact that claims were lowest in that year has more to do with fewer recalls and less warranty work needed. It was not linked to a dip in sales. As was mentioned, most of the Japanese manufacturers publish the amount of accruals they make each year. In fact, in fiscal 2017, six out of the nine manufacturers revealed this warranty metric. In fiscal 2018, we're still waiting for Subaru to publish its annual report, so we're down to five hard numbers and four estimates. But still, we are guessing only about 8% of the total. In Figure 3, Suzuki jumps into fourth place and Mazda drops back to sixth. Note that the two truck manufacturers are always near the bottom. While their average price per vehicle and accrual rate per vehicle are much higher than they are for the car manufacturers, they sell far fewer vehicles, and have lower sales totals than most of the others. Also, as is the pattern in the U.S., their expense rates are lower. For instance, Isuzu accrued only 0.3% of its revenue last year to pay warranty costs. The industry average was 1.8%. With accruals, fiscal 2016 was the peak year. This was the year that Honda acknowledged the huge size of the air bag recall problem it faced. We estimate that Mazda and Nissan also raised their accruals to record levels that year. And it comes a year before claims peaked, which is what one would expect: first the expense is predicted, then accruals are made to prepare for its arrival, then the claims are paid when the work is actually done. 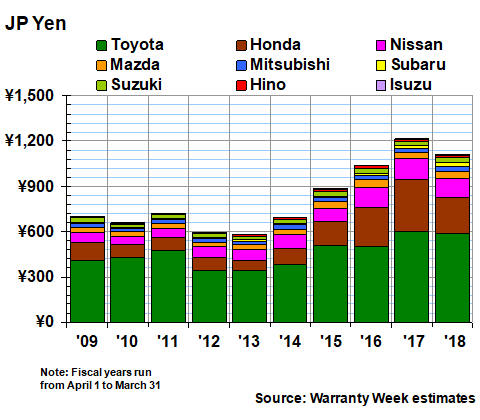 Over the past decade, Japanese manufacturers together have increased their warranty reserve fund balances in nine of the ten years. The exception came in fiscal 2018, when Honda and a few others let their balances decline, and the industry total slipped from 2,800 to 2,700 billion yen. Because of dollar-yen exchange rate fluctuations, however, that decline turns into a slight gain if we convert all the balances into dollars. However, those calculations are beside the point, because all of these are manufacturers based in Japan, and they build those exchange rate fluctuations into the balances they publish. 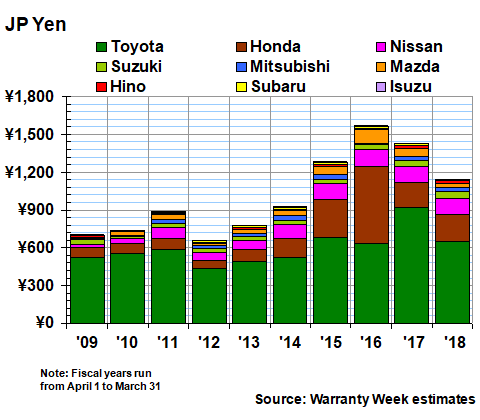 In Figure 4, we can see that Toyota and Nissan kept their balances roughly the same from fiscal 2017 to 2018, while Suzuki increased its balance, and Honda and Mazda let theirs drop. We should note that for the past three years, all nine manufacturers have published their balances, so there are no estimates needed. In terms of the ratio between reserves and claims, the pattern of the past decade has been for it to increase from fiscal 2009 to 2013, and for it to decline from fiscal 2013 to 2018. Back in fiscal 2009, these manufacturers held a reserve balance equal to 1.6 years of claims payments. By fiscal 2013, that ratio had peaked at 2.7 years. In fiscal 2017 it fell back to 2.3 years, but in fiscal 2018 it rose back up to 2.5 years. Over the past decade, it has averaged 2.3 years. The average claims rate of the Japanese automotive OEMs over the past decade has been very close to 1.5%. But there are two ways we can figure the accrual rate, however. Since all nine manufacturers also publish the number of vehicles they sell worldwide per year, we can also figure out a number for the average accruals made per vehicle sold. However, we question the wisdom of this, since with these nine product lines there are so many different kinds of vehicles. Suzuki, for instance, accrued only about 18,000 yen per vehicle last year (about US$170). Hino accrued 109,000 yen (about US$1,027). Toyota accrued 72,440 yen (about US$682). We think that has more to do with product mix and the average size and price of the vehicles involved, and less to do with any measure of quality, reliability, or the cost of warranty. Simply put, you can't compare trucks to motorcycles on a per-unit basis. 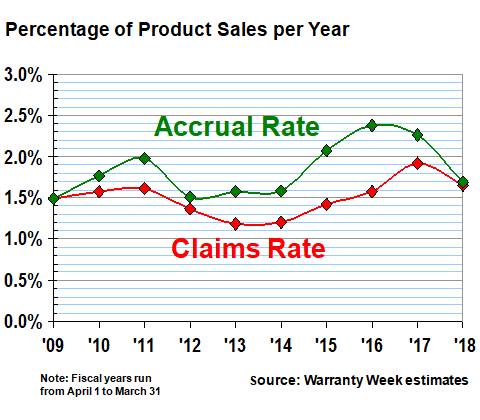 But since we have both accrual and sales totals in the same currency, we can make a better measure of the cost of warranty in terms of accruals as a percent of revenue. And on average, these manufacturers have been setting aside about 1.8% of their automotive revenue as warranty accruals over the past decade. As can be seen in Figure 5, our estimates suggest that the group hit its peak accrual rate in fiscal 2016, and its peak claims rate a year later in fiscal 2017. Again, this is what one would expect, with a surge in claims lagging about a year behind a surge in accruals. Conversely, a drop in accruals can be a leading indicator for a drop in claims. Note that in fiscal 2018, both the industry's claims and accrual rates fell back to around 1.7%. And that accrual rate is slightly below the long-term average. However, Toyota's accrual rate was much above average at 2.5%, and Honda's was at 1.7%. So the lower overall figure came thanks to others. For instance, Nissan was estimated at 1.0% and Isuzu was estimated at only 0.2%. We already detailed the Toyota and Honda warranty expense data in the July 5 newsletter, so we won't repeat it again here. In addition, some of the Nissan and Suzuki data, translated into dollars, was detailed in the August 16 newsletter. The news here is that while Toyota's decade-long average accrual rate is 2.8%, and Honda's is 1.7%, Nissan's is only 0.9%. In fact, the long-term averages of only Subaru and Isuzu are lower than that. Meanwhile, Mazda, Mitsubishi, and Suzuki have generally been in the middle of the range, with accrual rates between 1.1% and 1.5% most of the time. In other words, while Toyota and Honda have been towards the lower end of the scale worldwide, once we add in the European and American competitors, back home in Japan they're at the high end of the scale. And though some of that conclusion is based on estimates we've made, the bulk of it is based on hard numbers. Angie's List explains what to expect from a furnace inspection. Weighing the pros and cons of a home warranty. If you buy an iPhone XS or XS Max you should also buy AppleCare+. Sheriff's dispatcher charged with home warranty fraud. American Guardian Warranty Services celebrates its 20th anniversary. Safeware explains the value of theft coverage for students. Latest Sears rescue plan shows the end is near. How to choose a home warranty and avoid loopholes. Amynta Group to acquire Guardsman from Sherwin Williams. 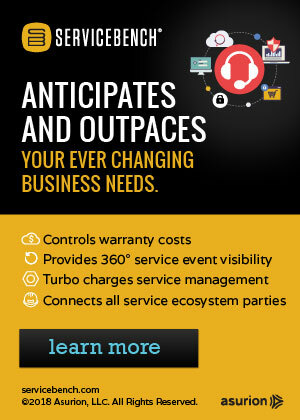 Centricity to participate at Extended Warranty & Service Contract Innovations. Silfab Solar lengthens warranty to 25 years, power guarantee to 30 years. How to remove the "AppleCare and Warranty" scam from your Mac. Tips to help F&I managers sell more vehicle service contracts. Stout releases 2018 Automotive Warranty & Recall Report. Multiple viewers complain to TV station about Choice Home Warranty. Landmark Home Warranty defines "emergency" as over 100 degrees F.
What has changed with AppleCare+ for iPhone XS & Apple Watch? Apple offers AppleCare monthly plans along with theft and loss option. Takeuchi US chooses Mize warranty management software. 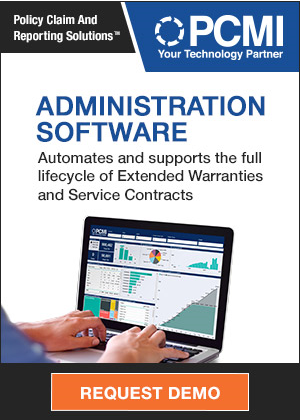 Warranty Processing Co. lets dealers streamline their operations. Warranty Direct Ltd. to use telematics services of Engie Motors Ltd.
All you need to know about extended warranty policies. The best repair, return and warranty policies for outdoor gear. National League of Cities Renews Partnership with Utility Service Partners. GWC Warranty VP makes Auto Remarketing's 40 Under 40 list. What are the real costs of home warranty plans and what's actually covered? Before buying a car, take a crash course on warranties & service contracts. 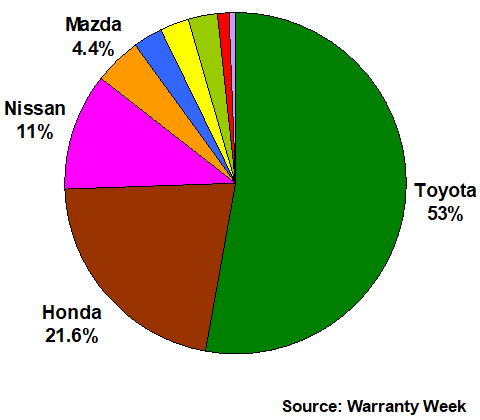 Honda & Toyota Warranty Report: Both companies are recovering from some bad years in terms of warranty costs: Honda in fiscal 2016 and Toyota in fiscal 2017. But according to the figures in their brand new annual reports for the just-finished year of fiscal 2018, both companies are now on the mend, with warranty costs that are still unusually elevated, but not as high as they were a year or two ago.